First impressions… iPod Shuffle 4th gen. I may have mentioned before that one of my favourite Apple products is the iPod Shuffle. I got a 1st generation Shuffle (A WHOPPING 512MB! ONLY £79!) back in 2005, primarily for gym listening… not a great environment for the old HDD-based ‘Classic’ iPods. The 1st gen Shuffle looks quite big and clunky now, but back then it was a wonderful blend of simplicity and beauty in miniature. An antidote to function creep, and I loved it. When I wore out the battery I learned to replace it. When it finally died of sweat inhalation (the slight drawback wearing the 1st gen Shuffle on its halyard) I bought the 1GB version, and when I accidentally washed that with my gym kit, I bought the improbably tiny 2nd generation model. These days, I use the Shuffle for more than just gym listening… I tend to just drag a few podcasts or downloaded radio shows onto it whenever I’m going out. As a result, the battery is now nearing the end of its life, and having fortunately glossed over the design own-goal of the 3rd gen model, I now have a brand new 4th generation replacement! Yep, I could have learned to do another battery change, but when the new Shuffle is only £40, it hardly seems worth the effort (slight sense of landfill guilt notwithstanding). As ever, it’s a beautifully designed thing in almost equally beautiful packaging. There’s no mini-dock with this version, so the tiny box only has to house the usual Apple earphones (destination: bin) and a rather stingy USB cable about 10cm long. Unless you have a high-power USB connection with easy reach, that’s going to be awkward. My iPods usually plug into a hub that’s glued onto the top of my Mac G5, under the desk, so I’m going to be looking for a cable extension pretty soon. That’s a minor inconvenience. What really bothers about the new Shuffle is the operating system. 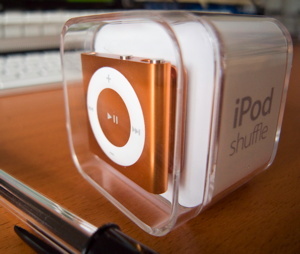 As with the previous generation, the new Shuffle can now store and play music from playlists… just like you have on larger iPods and iTunes itself. With no screen, you select playlists (and individual tracks) using the text-to-speech VoiceOver feature. If you choose to disable VoiceOver, the Shuffle simply defaults to “all songs” bypassing any playlists. Fine. As I’ve never needed playlists on my previous Shuffles, that’s how I’ll be using the new one, right? Well, no. When they say “all songs”, what they actually mean is “all songs, except for podcasts”. As I mentioned above, my Shuffle usage mostly involves catching up with my backlog of BBC 6Music downloads and podcasts. I just switch on and listen until it’s time to load some more. On the 4th gen Shuffle, that means I have to enable VoiceOver in order to access the podcasts. Still not a major inconvenience, but there’s one more thing. Each podcast (however many instalments there are) lives in its own playlist, and has to be selected individually via VoiceOver. For me, this is an inconvenience. I like to just hit “play” and then go through everything in date order. That means I get a bit of Stuart Maconie, a bit of Jarvis Cocker, some Laurie Taylor on Radio 4, the Guardian Science podcast, a Swedish language podcast… and then the same sort of thing from the following week. This is no longer possible without hitting the VoiceOver button several times. Just leaving the Shuffle to play (whether in “shuffle” or “play in order” mode) means that you’ll hear either all your standard songs or every instalment of just one podcast. That’s great for people who need that facility, but why not provide a way to switch it off? Bypass all the clever gubbins and just make the device play through each file in turn? I’ve tried a couple of hacks, such as putting both standard mp3s and podcasts into a single playlist in iTunes and then accessing that playlist via VoiceOver on the iPod, but without success. I’ll just have to modify my listening habits slightly. This is why I mentioned the pleasing lack of “function creep” on the original Shuffle. They’ve now added one of the more advanced features from the full-size iPods, simply because they can, and they’ve made a balls-up of implementing it in a less appropriate context. I still love the Shuffle concept, and I’m still in awe of Apple’s design skills, but… well, I’d actually like a bit less for my forty quid, y’know? It’s no longer a surprise to see Google doing their own version of just about every other Internet Big Thing. They’ve probably seen what Mark Zuckerberg is worth these days, hence the launch of something that, on initial investigation, looks pretty much like Facebook… with a different logo and more white space. Having thought I just couldn’t be arsed with it, my curiosity got the better of me. Easy stuff first… you can make status updates which, as on the most recent versions of Facebook, are part of a rolling timeline, not like the permanent strapline of the old Myspace. Those updates can include photos, videos, links or shared content from other people’s status updates. All very familiar, as is the facility to create photo albums, send private messages or chat in real time. Grouping your friends into Circles is pretty much like using Friend Lists on Facebook, and Sparks is just another way of “liking” stuff. Still, it’s not a complete clone. With Hangouts, a video chat/conference facility, Google stole a few days on Facebook’s Skype-based video chat service, while Huddle is a kind of group SMS facility. Even the familiar stuff is subtly different from Facebook, so in time, I wonder if people will be making a choice based on ease of use. For me, personally… it works fine, it’s easy to use and there’s nothing I particularly dislike about it. But I just can’t quite see WHY I’d want to continue using it. Almost all of the people in my Circles are already Facebook friends, and only a small minority of my Facebook friends at that. It’s easy to forget that most people don’t use social networking on a daily basis. It’s a bit like the situation with audio media in the 90s… having been persuaded to ditch their vinyl and buy CDs, people were just never going to buy into Minidisc or DCC. I suspect the same will be true of the slightly less internet savvy people for whom it was a leap of faith to move from Friends Reunited to Facebook. … although I’m starting to be a little bit surprised. Not, however, at the latest allegation that the NOTW hacked the voicemail of 7/7 victims. What’s really struck me since I wrote the last post is the slowly developing picture of life behind the scenes at News International. It’s a strange mix of sinister global media manipulation and utter comical incompetence. On one hand we have Rebekah Brooks as CEO, heading an investigation into her own company (now, where have we seen that approach to impartial investigation before?). But then they send out their secret surveillance team to spy on a Metropolitan police officer, suspecting that he might be having an affair with… his own wife. Come to think of it, though, it’s all part of the same process. The huge power and assumed immunity from the law has led to complacency and laziness. Why even bother gathering news in the traditional way, when you can just hack EVERYONE’S voicemail? There’s a fair bit of mission creep in there, too… hacking the voicemail of a Premiership footballer’s new girlfriend is a way of generating a salacious and exclusive story. But hacking the voicemail of Milly Dowler? You’re only going to hear her friends and family saying the same things that they said in the official press conferences. Apparently there are worse revelations to come; judging by how wanton and undiscerning their hacking tactics are starting to appear, I can fully believe it. … I jokingly remarked that at this rate it wouldn’t be long before a tabloid admitted to kidnapping Madeleine McCann, purely in order to generate a decent story on a slow news day. I’m starting to think my exaggeration wasn’t all that far off the mark. The thing is, some of us were already convinced that the News of the World is a nasty, cynical little rag, designed to exploit the most simplistic mob prejudices among its readership with the ultimate aim of filling Rupert Murdoch’s pockets as quickly as possible. But then we’re just politically correct Guardian-reading university types who scorn the Decent British Working Man, aren’t we? Even now, Murdoch isn’t above using a bit of clever PR to push public opinion in that direction, but I suspect it’s gone too far for that. The vital detail is not that arty-farty Guardian types are outraged but that News of the World readers themselves SHOULD be outraged. They’ve been sold a lie, whipped up into a froth over the paedophiles on every street corner, the mucky private sexual habits of posh people and of course the supposed institutional negligence of social services. And all the while, the newspaper that informed their world view was spying on a missing schoolgirl. The Sharon Shoesmith example is particularly apt as an indication of News International hypocrisy, as one blogger pointed out earlier. Rebekah Brooks may not have been aware of the illegal practices carried out by her deputies, but by her own standards, that’s no defence. Sharon Shoesmith was not aware of how social workers were dealing with the Baby P case, but Rebekah Brooks still saw fit to wage a hysterical campaign calling for her dismissal. There’s more to it, though. The News International tabloids have been closely linked with British politics for years. Murdoch’s approval was a major weapon in the political arsenals of both Tony Blair and David Cameron. Thanks to the latter, Murdoch stands to gain an even tighter control of our media, with his takeover of BSkyB. This isn’t about a newspaper using dodgy journalistic practices… it’s about a cynical, hypocritical attitude at the core of our media and politics. Sure you want to pay for that Sky subscription? 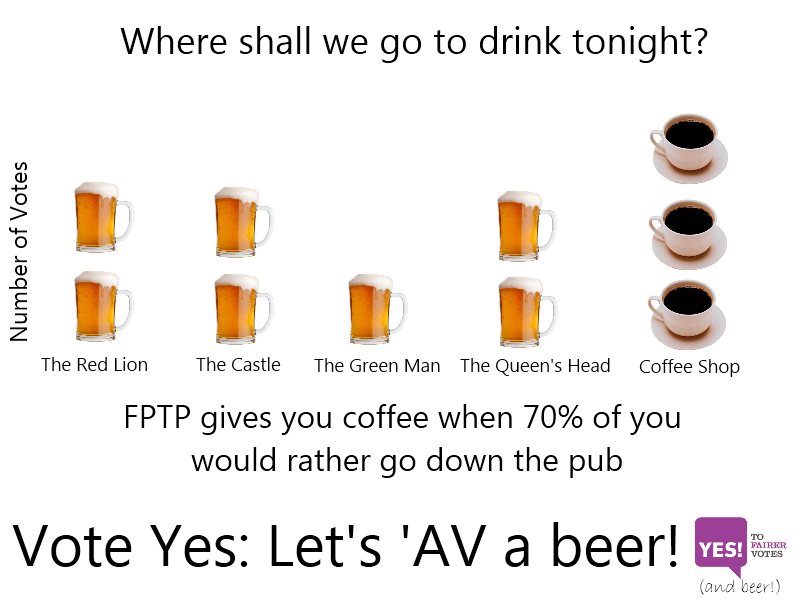 I’ll be voting ‘yes’ to AV tomorrow. That’s not to say I particularly want AV as our voting system, but unfortunately we don’t have the option of proportional representation. It’s Alternative Vote or First Past The Post, and I don’t see British politics (or our general attitude to it) improving while FPTP remains in use. It’s pretty clear to me that our voting system is in need of reform, and a ‘no’ result simply suggests that we’re happy with what we’ve got, thank you very much. I don’t care if AV is flawed or a weak compromise… it’s reform, and democratically driven reform is a good habit to get into. Nothing is forever, either… what’s to stop us going back to FPTP, or even having a three-way referendum with another option? The No2AV campaign has praised the simplicity of the FPTP system, and indeed, all you have to do is choose your favourite candidate and stick an “X” by his/her name. Well, that’s what some people do, and you can do that with AV, if you choose to rank only one candidate. But that discounts the huge number of people who vote tactically, voting to hinder an unfavoured candidate, not to help a favoured one. I don’t know about you, but I’ve gone through some pretty complex mental gymnastics on polling days past, trying simultaneously to maximise the damage I can do to one candidate, to assuage my feelings of guilt over not voting for my favourite (no-hoper) candidate and to find a compromise candidate who at least has a vague hope of winning. Simple, eh? What always grabs my attention in statistics like those is that 62.9% of the people voted against the winning candidate. Let’s forget the people who didn’t vote at all, even if their non-vote was intended as a protest. And even if we assume, for the sake of argument, that the four lowest candidates could conceivably be disaffected Tories (although, realistically, at least two of them are just thugs). You’ve still got 55.4% of that constituency’s voters who don’t want the winning candidate. That’s just one mildly marginal constituency. There are worse examples, where the simplest of choices gives a vague, inconclusive picture of the true opinions of the electorate. And this isn’t just the whinings of a disappointed centre-left tactical voter, either… there’s a whole range of situations where a mixture of tactical voting and policy overlap have led to seats being won unconvincingly. To me, this is an obvious case for reform. And then there was David Cameron’s claim on Radio 4 that AV results in some people’s votes being counted twice. It’s twaddle. If anything, it’s fairer than FPTP in trying to make everyone’s vote count at all. In the Lincoln example above, if you voted UKIP, your vote was worthless. Under AV, you’ve at least had the chance to form a contingency plan in the shape of your second (or third, etc) choice… “if this vote doesn’t work, please give it to the Tories instead”. It’s better than nothing, and depending on the behaviour of your fellow voters, FPTP means you enter every election with the risk of getting nothing. Finally, the bogeyman argument. We’re told that AV will make it easier for undesirable parties such as the BNP. Well, we’ll have to wait and see, but I disagree. 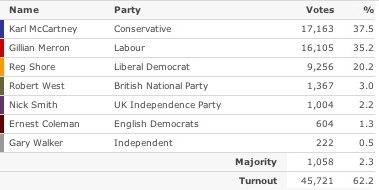 Votes for extreme parties are frequently protest votes… we’ve seen as much from areas where the BNP have done incredibly well in (supposedly low-impact) council elections, but then incredibly badly in the big serious General Election. If anything, I could see those votes decreasing under AV; there’s less chance of a kneejerk vote when you no longer have to stick a single ‘X’ in a box. The milder bogeyman argument is that AV will lead to more coalitions, and again, this is pure speculation. The current coalition was formed under FPTP, as were the Lib/Lab pacts of 1924 and 1977. And anyway, so what? Who’s to say that the single-party government is any more the “correct” system than FPTP? Perhaps we need parliamentary reform just as much as we need electoral reform, and in a country with so little experience of coalition government, those two isolated examples (formed under a different system and for very specific reasons) are no argument against future coalitions. Even assuming Twitter doesn’t go all evil on us, there are going to have to be some changes even to maintain the current level of useability (whatever your opinion of that). Even if the userbase doesn’t change, the rising popularity of linked apps will result in a steady traffic increase. As with all those Farmville (etc) updates on Facebook, endless automated tweets from Instagram, Foursquare and old favourites such as Flickr and last.fm could easily become the noise that overwhelms the proper content on Twitter. Of course, you can unfollow or block anyone instantly, but these automated tweets could just as easily be coming from your best mates. It’s all about being selective. On Facebook, it’s a trivial matter to filter updates from specific apps, so a person’s regular status updates are unaffected, but no such option currently exists on Twitter. Rather than worrying about third-party developers using their API, Twitter’s next move should be to incorporate some of the filtering and muting features already provided by Nambu, Echofon and others. If you prevent people from accessing your social networking facility via third-party clients (such as Tweetie, Tweetdeck, Dabr, etc) I will simply stop using you. There’s evidence around various websites and social networks today to suggest that many thousands of other people will do the same. I’m sure a minority of people will stick with you, either because they’re willing to put up with your clumsy, piss-poor web interface, or because they’re (incomprehensibly) already using it as their main conduit, and won’t notice the change. But you’ll be another Myspace by that point. An irrelevant corporate walled garden. The point is, social networking is not about the tools. Stating the screamingly bloody obvious, it’s about the social network. That’s why people (myself included) are setting up accounts on other microblogging networks, just in case, y’know. We have no loyalty to you, or any other platform. We’re the content; you’re just the plumbing.